I've had a MarkBass Little Mark 250 through the same cab and it didn't sound much different. I've also heard the TC Combo version of mine and it didn't sound significantly different to any of the other 15" combos around the same price point that my mate was testing in Andertons at the time. So a mixture of the bass and amp settings I'd assume. All images load, in situ in the post, with no extra action here. I think they are 4-5 Meg B images, so may take a while to show themselves. Wonks wrote: I think they are 4-5 Meg B images, so may take a while to show themselves. Nope. Twizzle then still "Image failed to load" I didn't generally have a bother will check elsewhere. Wonks wrote: I've had a MarkBass Little Mark 250 through the same cab and it didn't sound much different. 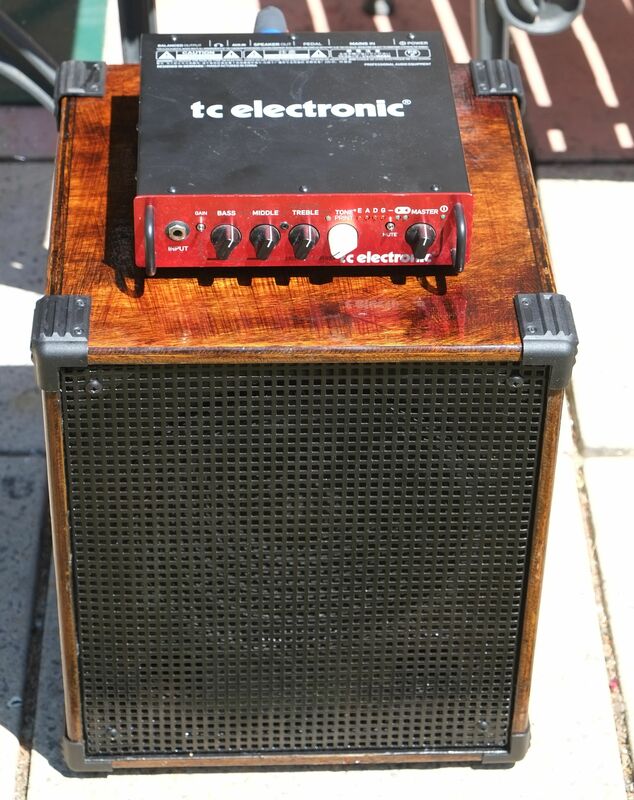 I've also heard the TC Combo version of mine and it didn't sound significantly different to any of the other 15" combos around the same price point that my mate was testing in Andertons at the time. So a mixture of the bass and amp settings I'd assume. Love that cab finish wonks - very retro! The first lot of (water based) varnish didn't adhere to the wood, apart from in a few places where it stuck very well indeed. I'd just started to sand it flat prior to polishing and it came off in sheets. The outer veneer of Meranti on the ply then sanded through in places when I was getting it off and getting the surfaces level again, so it looked very patchy. I was then just going to paint it a solid black, but then changed by mind and re-stained it and then used yacht varnish for a warts and all look. Wonks wrote: I was then just going to paint it a solid black, but then changed by mind and re-stained it and then used yacht varnish for a warts and all look. Well, it originally didn't have any of those sanding marks on the top, but when I re-stained it, I did a black stain first then rubbed it back a bit and then did the brown, which highlighted those marks (left from getting the few stuck patches of old varnish off. Sanding those marks away wouldn't have left any of the original facing veneer on the top, so I left them.